Let me start by saying I completely forgot about Free Pattern Friday this week. My mind has been elsewhere. I’m sure that once I explain, you’ll understand. For most of the week, I’ve been fielding emails and social media messages in my role for The Linus Connection. Our organization is doing what we can to help with the relief efforts for Hurricane Harvey evacuees by providing handmade blankets to children displaced from their homes. 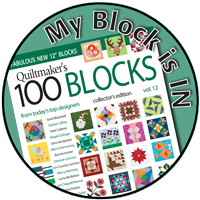 In addition to our local volunteers, we’ve had quilters and blanket makers from all over the country step up to help. The outpouring of love and helping hands has been amazing. If you’d like to help, check out this post on the Linus website for more information. I’m the Jennifer listed in the graphic above, so you have questions, please feel free to ask! You can comment here or contact me at my Linus email. If you’re local, you can drop handmade blankets & quilts off at Honey Bee Quilt Store. We will continue to collect blankets & quilts as usual at our monthly meeting on September 16. As of yesterday, we’ve been able to get over 200 handmade quilts, yarn blankets, and fleece blankets into the hands of the Austin Disaster Relief Network. Those blankets will go directly to those children affected by hurricane-related evacuations. 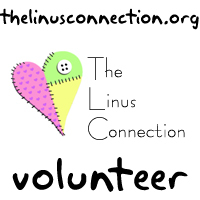 To stay up to date on what The Linus Connection is doing to help, follow us on Facebook, Instagram, and Twitter. In between email, social media messages, and other updates, I’ve been working furiously to finish a few of my Linus WIPs. 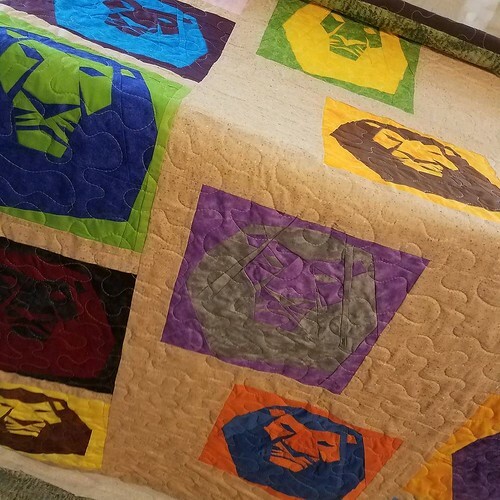 Lion King Quilt 2 is quilted and needs binding. I’ve got another UFO block quilt top quilted. It also needs binding. I’m hoping to get those finished today. Yesterday, I needed to run to Jo-Ann’s and I scored two good sized remnants of fleece while I was there, one Spiderman, and one Batman. I’ll be turning both of these into blankets for Linus, too. 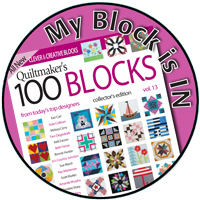 Want to help, but don’t want to make a quilt or blanket? Donate to the Austin Disaster Relief Network. This is a local organization. They will get much-needed donations where they need to go. More about their efforts for those affected by Hurricane Harvey. Donate to Austin Pets Alive. They are the non-profit where we adopted our fluffy orange cats, Ramses & Iliad. APA and their volunteers have rescued hundreds of displaced pets and are collecting supplies to help take care of them. There is loads more information on their Facebook page. 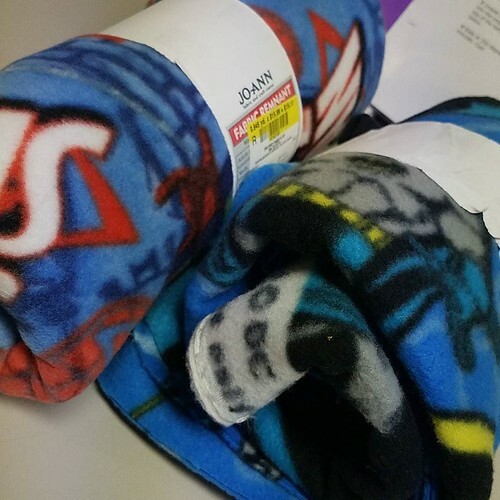 Make a pillowcase and donate it for the new pillows going on the shelter beds. Honey Bee Quilt Store has free kits. Contact the store for more information. You can also use one my free tutorials to make a pillowcase. Video here. Text version here. These are just a few of the ways you can get involved. These are some of my personal favorite ways to help. Do what works best for you. 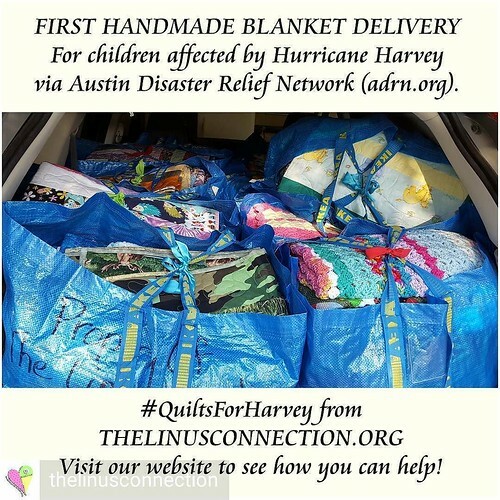 This entry was posted in The Linus Connection and tagged austin, donate, hurricane harvey, hurricane relief, linus, linus connection, pillowcase, quilts for harvey, quilts for texas, texas strong, The Linus Connection, volunteer on September 1, 2017 by Jennifer Ofenstein. Welcome back to Free Pattern Friday! After an April that was all about ME, I wanted to share some fun charity projects in May! First up is a child-sized quilt pattern I designed inspired by the heart logo of my favorite blanket making charity, The Linus Connection. Made of 5 1/2″ squares and half square triangles, this is an easy peasy quilt to chain piece. Make it for a wee one you love or for your favorite blanket charity. Bonus points if you make one for The Linus Connection! This is a quick to watch tutorial on chain piecing from Shiny Happy World. 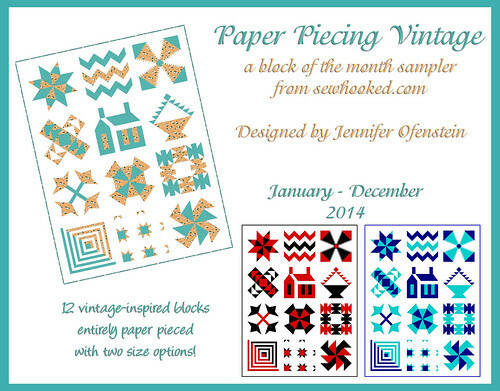 Are you quilting along with Paper Piecing Vintage? 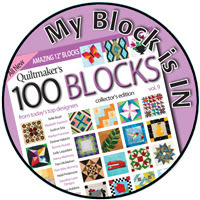 Share a Signature Block for the PPV Signature Quilt! This special project is a for a commemorative signature quilt that I will keep after Paper Piecing Vintage has concluded. 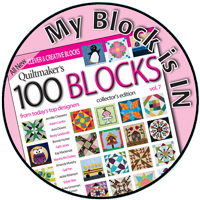 Find this block on page 21 of Paper Piecing Vintage. 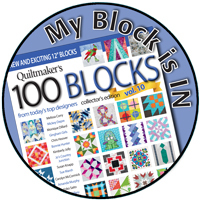 If you’re only making a few blocks, you can also find the Signature Block Pattern right here. 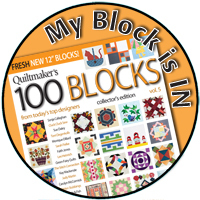 Stop by Sewhooked on the second and fourth Mondays of every month through June for the Paper Piecing Vintage Quilt Along (PPV2017)! 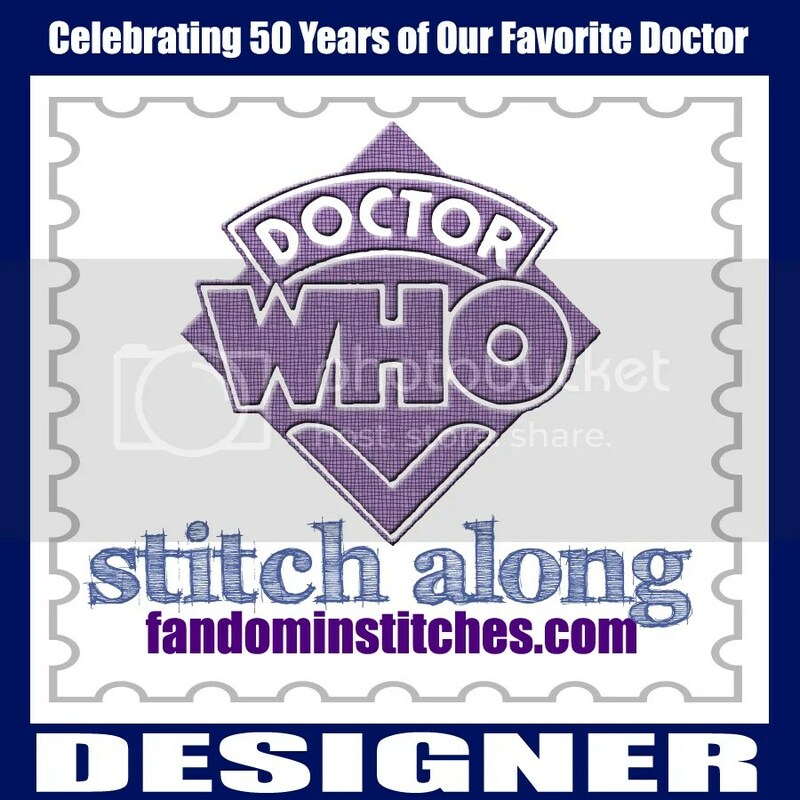 Happening now on Fandom in Stitches! Do you enjoy my free content? Consider Becoming a Patreon Patron and help keep me keep creating and sharing! 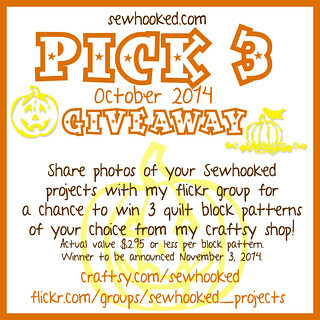 Join the Sewhooked Facebook Group for community, support & prizes! 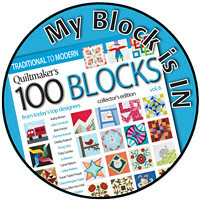 I’ll be there, as will my awesome pattern tester Amber along with many other friends of Sewhooked. We’ll answer your questions and nudge you along if you need it. Joining the group is never required, but it is fun! This entry was posted in charity, Free Patterns, The Linus Connection, tutorial, video tutorials and tagged big linus heart, chain piecing, charity, free pattern, free pattern friday, half square triangles, linus, linus connection, The Linus Connection, traditionally pieced on May 5, 2017 by Jennifer Ofenstein. 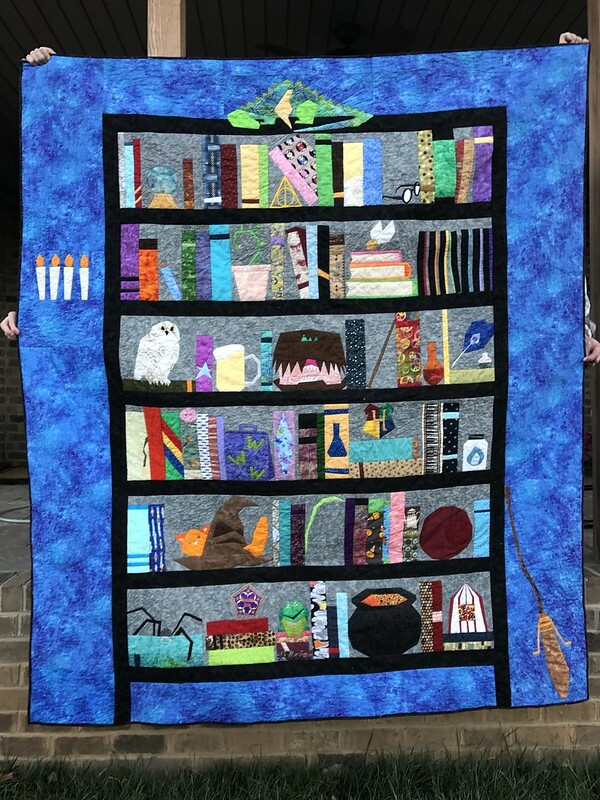 Win a Harry Potter Bookcase Quilt! Want a chance to win this Project Of Doom Harry Potter-inspiredbookcase quilt AND help 13-year-old Kenzie get the new kidney she needs? Donate $5 to Kenzie’s GoFundMe and get one chance to win. Donate $20 and get FIVE chances to win. Can’t donate? Then please share this link! 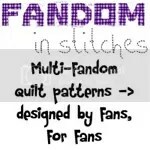 This wonderful quilt was made by the fantastic Jennifer Rowles, a fellow Fandom in Stitches designer. She pieced and quilted it as part of a fundraiser to help a 13-year-old girl that really needs a new kidney. 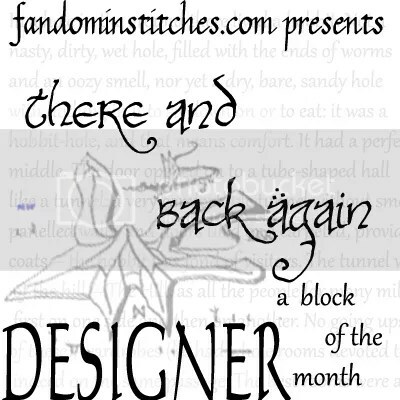 Inside blocks designed by me, outside blocks designed by the Fandom in Stitches designers. Find all posts on Sewhooked about PPV 2017. Stop by Monday for our next block to piece! 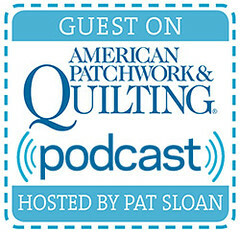 See you tomorrow for Free Pattern Friday! 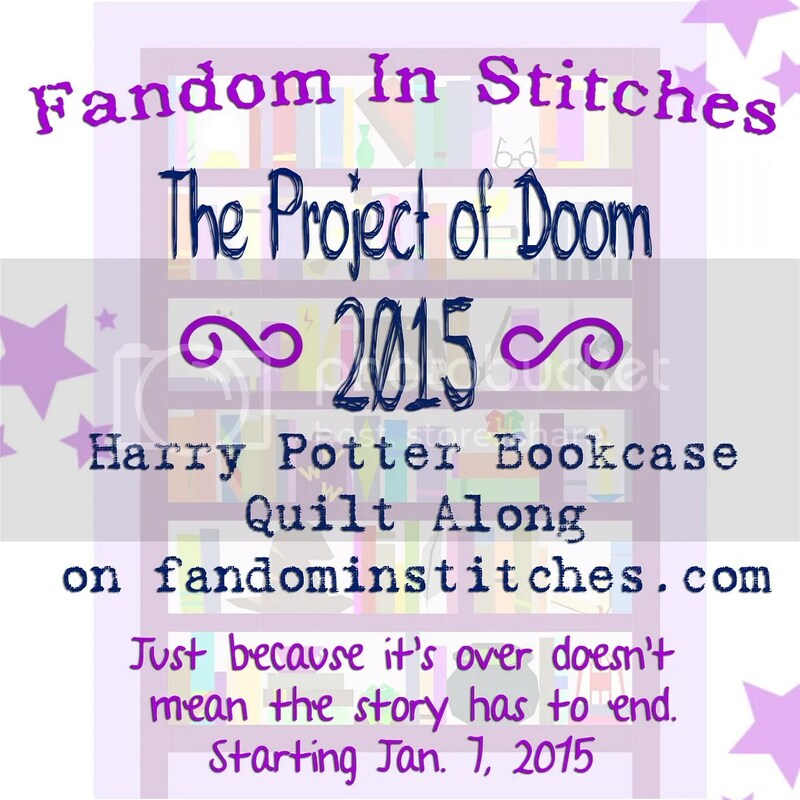 This entry was posted in charity, Project of Doom and tagged fundraiser, gofundme, harry potter, harry potter quilt, kenzie, Project of Doom, the project of doom on March 23, 2017 by Jennifer Ofenstein. TTMT #409 – Storm the Castle! 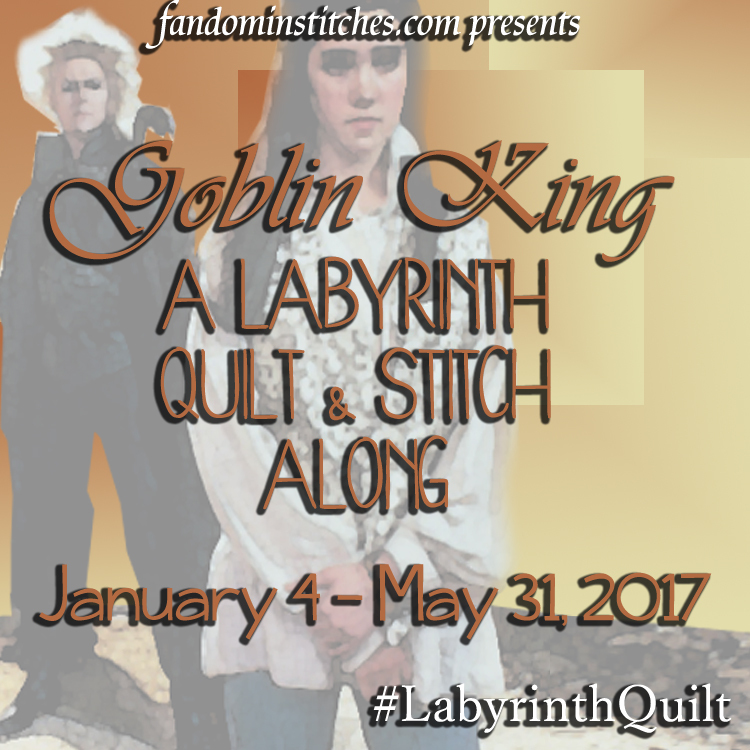 Today I share my FINISHED 2015 version of The Project of Doom made during the quilt along hosted the same year on Fandom in Stitches. This is the third full version of this quilt I’ve made by myself. I’ve also made several as part of collaborations for charity. This one is made from Stonehenge fabric. It was designed, pieced, quilted, and bound by me. It will also be labeled by me a.s.a.p. so I can start using it! 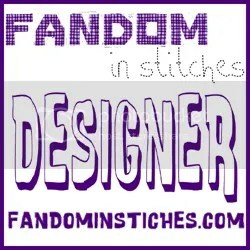 Stop by Friday for more featured free patterns! 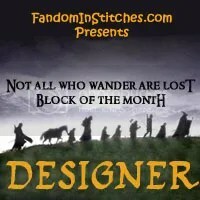 This entry was posted in harry potter, Project of Doom, talk to me tuesday, The Linus Connection, ttmt, vlog and tagged 2017 finish, charity quilts, fandom in stitches, harry potter, harry potter bookcase quilt, harry potter quilt, linus connection, orphan blocks, pod, Project of Doom, talk to me tuesday, The Linus Connection, ttmt, vlog on February 21, 2017 by Jennifer Ofenstein. Juki 2010Q, my new sewing machine…so far, so good! 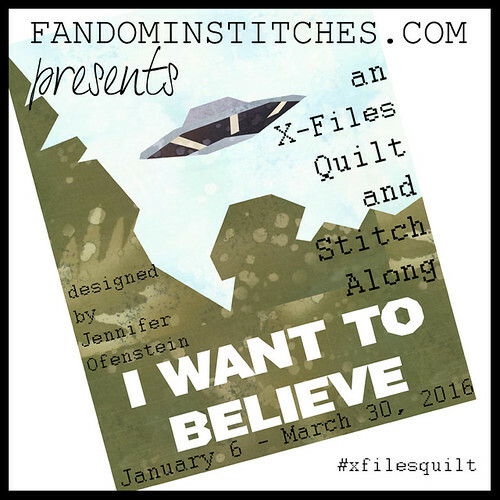 This entry was posted in Fandom In Stitches, sewing, The Linus Connection and tagged blanket charity, clothing, fandom in stitches, juki, sewing, The Linus Connection, vest on June 16, 2015 by Jennifer Ofenstein. Reminder: Silent Auction on Saturday! 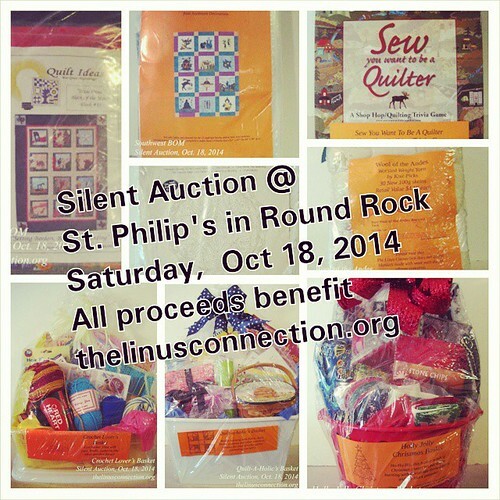 There will be a LIVE Silent Auction on Saturday, October 18, 2014 at the monthly meeting of The Linus Connection at St. Philip’s United Methodist Church in Round Rock Texas. There are lots of great things to bid on. All proceeds go toward buying blanket making supplies for Linus volunteers! Check out the Silent Auction Preview over on The Linus Connection for more details! This month’s giveaway is a bit different! 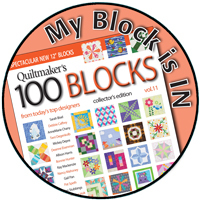 Stop by the Sewhooked flickr group and share photos of your quilt blocks & projects made fromSewhooked patterns, including Paper Piecing Vintage or any other pattern (free or for sale) designed by me. 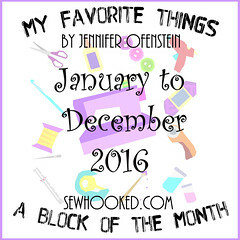 You will each project you share, you will be entered to win your choice of THREE individual block patterns ($2.95 or less each) from my Craftsy Shop! Click on the banner to go Sewhooked flickr group. Winner to be announced November 3, 2014! This entry was posted in charity, The Linus Connection and tagged fundraiser, linus, silent auction, The Linus Connection on October 17, 2014 by Jennifer Ofenstein. 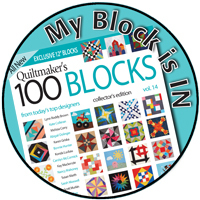 Share your Paper Piecing Vintage photos with the Sewhooked flickr group in April and you’ll have a chance to win a copy of Quilts From 100 Blocks, Fall 2013 (includes a pattern designed by me!) 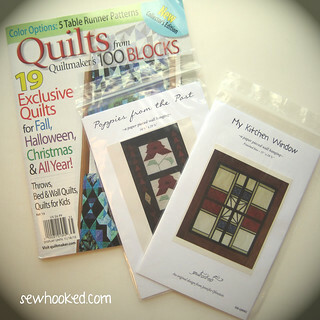 as well as copies of my patterns Poppies from the Past and My Kitchen Window! Featured Pattern: Bicycle!, just $2.95 on Craftsy! This entry was posted in charity, Fandom In Stitches, Fandoms, harry potter, Project of Doom, The Linus Connection and tagged charity blankets, charity quilts, harry potter crafts, harrypottercrafts, make-a-wish, The Linus Connection, the project of doom 2014, yarn drive on April 15, 2014 by Jennifer Ofenstein.